Ranges from tube-like growl to high-gain distortion. Overdrive is strongest in the midrange, retaining low-and high-end frequencies. Active 3-band EQ with 3-position mid shift. 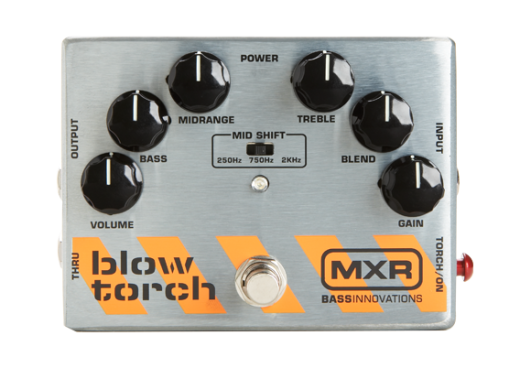 The blowtorch is a must for every bass player. It's not just a distortion pedal. It's a powerful eq pedal as well. You will have 18v of tone shaping power. 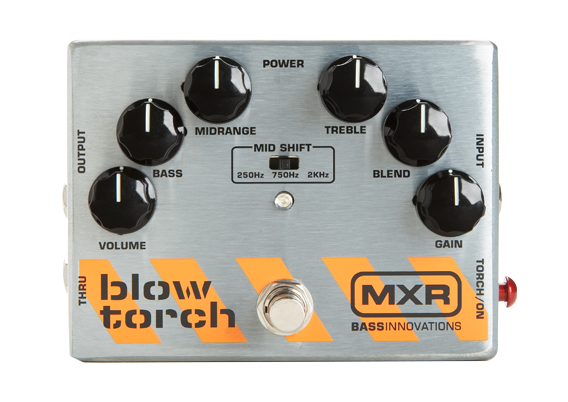 Thanks MXR. I am not in any band or play abroad. Yet I saw this and picked it up. I'm completely impressed at what it can do. Some days I just plug it in and play around which is fun. This is a very good petal for someone who never owned one before. This pedal is amazing, from grumbling tube growl to crunchy distortion or classic fuzz this does it all. Those who have given it bad reviews need to learn how to shape their sound. The built in smart gate works perfectly, sustains as long as you want to hold, it has a very good on board EQ, no tone loss what so ever. I've been using it through a SWR 10 combo, the growl and OD give it the feel of a 4x10 Cab. This pedal is a must have for bassists.